What will airport communications look like in five years’ time? One major change will definitely be the departure of payphones. With the vast majority of travellers now carrying their own cell phones around in their pocket, payphones just don’t seem to fit any more. The only real problem with using your cell phones (prohibitive roaming charges) is also fast disappearing, as voice over IP (VoIP) cell phones becomes the norm and pressure is brought to bear on incumbent telecoms providers to offer alternative ways to connect. (Both legislation and market demand are forcing companies to offer Wi-Fi, 4G and (no doubt) a long line of further new technologies). The ubiquitous Internet desk, which became an airport must-have over the last decade, is also fast becoming obsolete. Although they still offer a reasonable income for a handful of airport operators, this revenue stream is drying up fast. End users will no longer be wowed by low impact internet kiosk software desks and will start to expect a much higher quality experience, opting for something with a bit of a novelty factor. Airports can be a stressful experience and few would consider the two or three hours spent there to be a pleasant experience. Airports offer an uninviting blend of long queues, mad dashes and a lot of waiting around. Helping to alleviate any of these issues would certainly be a wise business move. If delivered correctly, solutions that offer travellers convenience & value will certainly improve their airport experience, and are an excellent opportunity to secure recurring revenue. 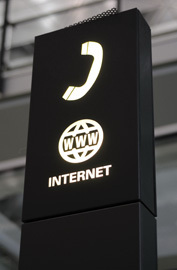 I would expect that airports are going to start procuring global VoIP deals (similar to Skype) as a way of moving on from payphone technology. This will be great for consumers, who will then be able to call home for much less than using landlines or cell phones. Convenience & value would certainly be there if the providers would offer a flat call fee no matter where the call is being routed to. al marketing (time- and location-based advertising) have enabled such operations to offer a much more reliable platform to large businesses with advertising budgets to spend. If positioned correctly, this could pave the way for free-to-use internet access, with other ways of deriving value from the consumer such as contact details, well-directed marketing and location-based money off vouchers. The main challenge when setting up an airport operation is the diversity of your target audience. (15 year old Facebook-ers and 40 year old businessmen sitting next to each other in an Internet Access zone). Being able to tailor your offering to meet these different users comes down to skilful design. Creating different media zones is one way to achieve this; marked-out areas where consumers can expect a certain style of interaction. Airports could loan out tablet computers for informal browsing and social networking and the content displayed could vary based on their location in the airport. The world of emerging technology is certainly fast paced and airports intensify this to a great degree, and as such has become a marketplace for aspirational technology. The future for airports certainly looks different.